Late Season Sun: Luxe Mallorca. You’re looking for a late break in the sun, that’s off the beaten track but doesn’t compromise on style, so let us take a stab that Mallorca – for Brits, one of the most well-trodden paths of all – was not on your list. We’re here to tell you that you’re mistaken, that you really ought to look at the island with new eyes, and that – luckily for you – Mallorca has a kind soul and a generous spirit, so will forgive you for the slight. Here are two new hotels that will change the way you look at her forever. 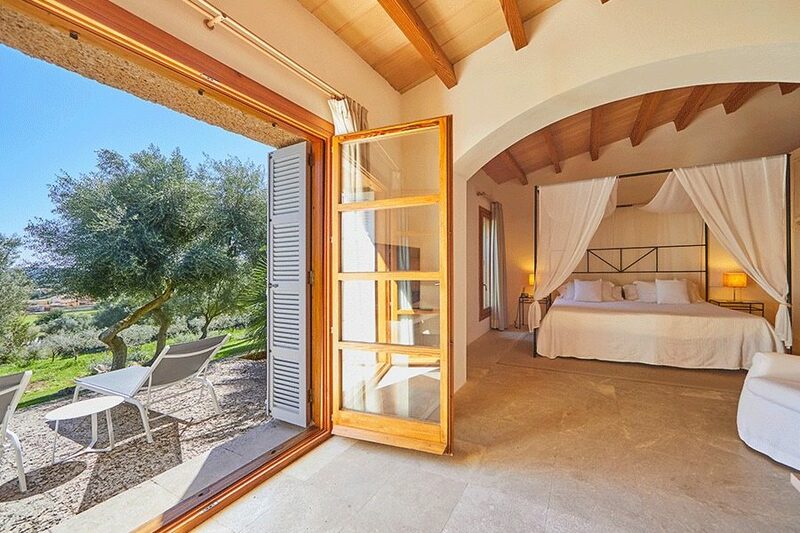 Surrounded by ancient olive groves and set in more than 200km of rolling countryside on a Mallorcan estate, Son Penya Petit Hotel & Spa, is an oasis of relaxation; a former Finca with 20 beautifully appointed stone-built rooms and suites, some with private pools, just outside the village of San Llorenç on Mallorca’s east coast. The hotel produces its own olive oil, which is used in the hotel’s gourmet restaurant. In the last week of October guests can join the olive harvest, or simply relax by the outdoor pool, enjoy yoga in the garden and use the facilities of the wellness centre with its indoor pool, sauna, Turkish bath and spa. Beyond the hotel it’s just a short cycle ride from La Via Verda or ‘Greenway’, a 29 km path that opened in 2014 to link Manacor with Arta and follows the route of an old railway. Spot Falcons as you cycle its car free trail. Or hire one of the hotel’s brand new electric BMW 3 series cars to explore the quiet east coast with its National Parks, stopping at a Bodega for wine tasting and to see the dramatic coastal caves of Cuevas del Drach at nearby Porto Cristo. The cooler month of October is the perfect time to explore Mallorca’s UNESCO Tramuntana Mountains and sees locals and visitors alike taking to the hills to explore its walking and cycling trails. On the road linking Soller to Lluc, there’s a huge picnic area at Sa Bassa where visitors can even set up a barbecue to grill some locally cured bacon, a juicy steak or freshly caught prawns before heading out for a walk. After a day in the hills guests at boutique Hotel L’Avenida in the centre of Soller, can return to the historic turn of the 20th century Modernist townhouse. Mixing high end design with beautiful period details, guests can relax in one of its 12 individually decorated rooms or by the pool in the shady garden. Llaut Palace Hotel & Spa is a five star oasis in Playa de Palma just a few minutes from the beach and 4 km from the airport offering supreme comfort, style and elegance in its 162 spacious deluxe bedroom, with a further 24 junior suites. 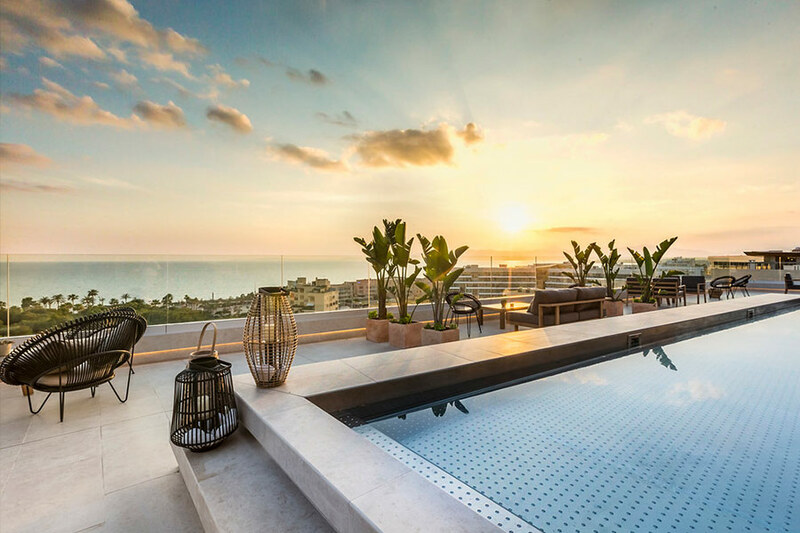 The stylish Katagi Blau restaurant (which means ‘under the sky’) is located on the top floor of the hotel with panoramic, sunset views across to the capital Palma and serves a fusion of Asian cuisine with the freshest local ingredients. The hotel’s spacious spa has seven treatment rooms offering a choice of facial and body treatments. In addition the thermal suite comprises two saunas, Turkish bath, jacuzzi, cold water plunge pool and ice fountain. In the centre of the spa is a large indoor hydrotherapy pool with a series of underwater massage bubble beds, as well as a swan neck jet, underwater body massage rings and vertical jets. Spa treatments are inspired by its Mediterranean location with their signature 90-minute Mediterranean Ritual comprising a full body exfoliation, body wrap and body massage with a choice of citrus or sweet aromas. In addition, the spa offers Ayurvedic massage, Hot Stone massage, Reflexology and Champi, as well as a number of beauty treatments.